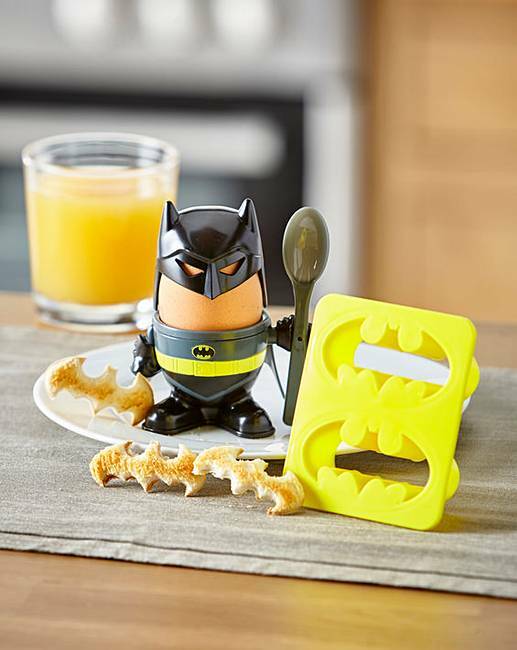 Batman Egg Cup & Toast Stamp is rated 4.6 out of 5 by 12. Set includes egg cup, egg topper, spoon and batman logo toast cutter. Rated 5 out of 5 by jenric from Looks Fabulous! I bought this to send to my grandson in Australia as a Christmas present and am absolutely delighted with it. He is crazy about Batman and I am positive they have nothing like this in the shops in Oz! So chuffed. Rated 4 out of 5 by sasha41 from made a nice present I bought this as a birthday present for my brother, so i've not actually used the contents of the box, but it comes presented nicely in the box and looks nice. I think perhaps it is slightly overpriced. Rated 4 out of 5 by Ama from Batman Egg Cup & Toast Stamp Bought for my son (young at heart batman fan!) And he loves it. Made him smile lots. Rated 4 out of 5 by Mojo from Good Fun Bought as secret santa present for male - looks well made & good fun. Rated 5 out of 5 by Jane from Great This was really great, my Grandson totally loved it.